When Optimus Prime dealt a crushing blow to Megatron in the Battle of Chicago, the triumph was short-lived. The victorious Autobots were rewarded with exile and new enemies determined to bring about their total destruction. If there was ever any doubt, the Autobots now know for certain: as long as there is a Decepticon with a spark in his circuits, their centuries-old was will continue. Well that’s a misleading bio if there ever was one: Galvatron has no spark. In fact, after the Battle of Chicago, I don’t believe there is a single Decepticon left with a spark. Of course, in Age of Extinction (AoE) humans have built an army of sparkles Transformers for their own purposes, only to have their flagship robot, Galvatron, infected with Megatron’s personality. The resurrected Megatron, now going by his human-given name Galvatron, proceeds to take control of the human-built sparkles Transformers, which effectively become a new army of Decepticons lacking any of the insubordination issues the original faction had to deal with. It always seemed the obvious option for Galvatron to become the main villain in a fourth Transformers film, so the revelation he was to feature in AoE came as no surprise. What was somewhat was somewhat surprising was the fact he barely featured, and was more there to setup a thread for future films. Regardless, it marked the return of Frank Welker as the voice of the leader of the Decepticons – a role reprisal as well, as he also voiced Galvatron in the original ‘80s cartoon (except in the movie of course, where Galvatron was voiced by Leonard Nimoy). Throughout the live action move series, Megatron was cursed with impossible alternate modes and bizarre robot modes, with the exception of the excellent Mad Max style Mack Titan oil tanker (which also produced the best movieverse Megatron toy, at Voyager scale). Galvatron has the opposite problem: an impossible silver / light grey robot mode that turns in to a perfectly possible dark grey truck. How on Earth could the designers tackle this successfully in a toy? Galvatron transforms into a very cool dark grey 2014 Freightliner Argosy cab, measuring 6.5” (16.5cm) long, placing it at about 1/39 scale. It’s a chunky vehicle mode that dwarfs Voyager Class Evasion Mode Optimus Prime’s truck mode, which looks to me to be a Marmon Co” Heavy Duty Cabover (with sleeper) – unfortunately I can’t find dimensions for that, but would imagine it is smaller than the Argosy in reality. The truck is sleek, well detailed, and menacing – this is effectively a Nemesis Prime mode. The bulk of the cab is dark grey plastic, with black and silver detailing plus blue lights above the smoky transparent plastic windows. Sadly the smoke stacks aren’t picked out in a different colour, and the headlights and other running lights would have looked cool in blue. These are minor niggles though – from the front or side, Galvatron looks absolutely awesome in Argosy mode. From behind, unfortunately, there are just hinges and a small gap into the cab (although nothing so obvious as the gaping hole and false cab windows on the rear of Evasion Mode Prime). Some moulded brake lights, preferably painted, would have been nice. From above the rear part of the truck is cast in light grey plastic (except for the wheel arches, which are black), and there is a huge gap showing that the legs which make up this section of the vehicle do not quite meet in this mode. Also, a Decepticon insignia is conspicuously absent. Still, I would say, overall, I love this menacing dark grey Argosy mode. 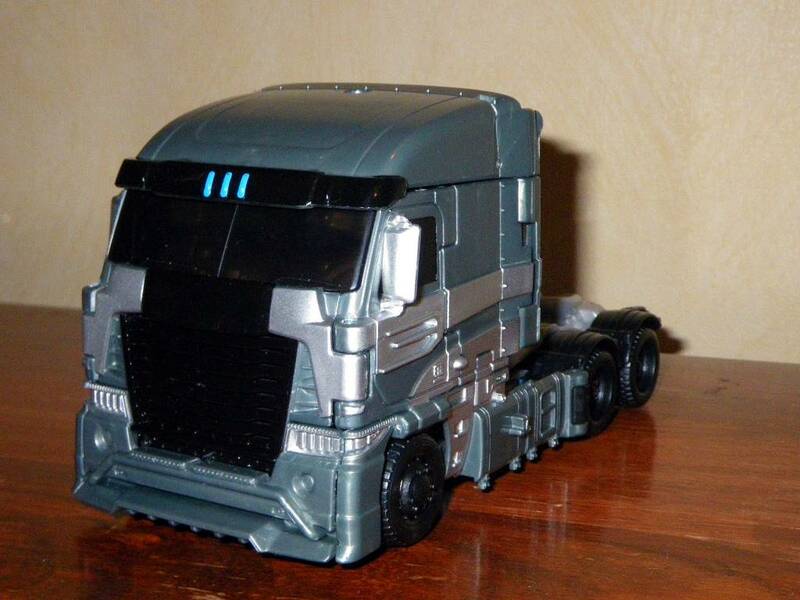 As already mentioned, Galvatron is a silver or light grey robot that turns into a dark grey truck. He is also extremely detailed biomechanoid in design, with various blue highlights, showing no vehicle mode parts (by virtue of the crazy new transformation system the Decepticons have thanks to human designers). How on Earth could the designers pull this off as a toy? Well, actually, they’ve done a damn good job. The transformatrion is extremely simple. The box proclaims just 17 steps, but I’d say that’s an exaggeration – there are really only eight. As was always going to be the case, Galvatron is a shellformer. The cab completely folds down in an extremely innovative way, sitting flush against his back, with the arms and part of the chest and head unfolding from within. The rear of the cab splits as the legs, which rotate with legs flipping out. Part of the truck body folds down to cover the wheels behind the legs, although these remain slightly visible. It really is a work of brilliant design, and is amazingly fun to play around with. It reminds me of what I love about the Prime line – great design with clever but generally simple transformations. He is the total opposite of AoE Voyager Evasion Mode Prime, which is quite fiddly and complex (although very impressive, no doubt). The only negative is that the truck cab backpack extends slightly on either side of his torso. This figure would have been perfect had the designers figured out a way for these to fold behind the robot mode, but it’s still an amazing job and better than all movieverse Megatron toys with the exception of DOTM’s Voyager Class figure, which continues to set the standard. Galvatron’s robot mode is big and bulky, just like the film version. Standing 7” (18cm) tall, Galvatron is a respectable size for a Voyager Class figure, and looks Voyager Class Evasion Mode Prime in the eyes, while being bulkier. The level of moulded detail is fantastic, capturing the biomechanoid feel of the movie design. 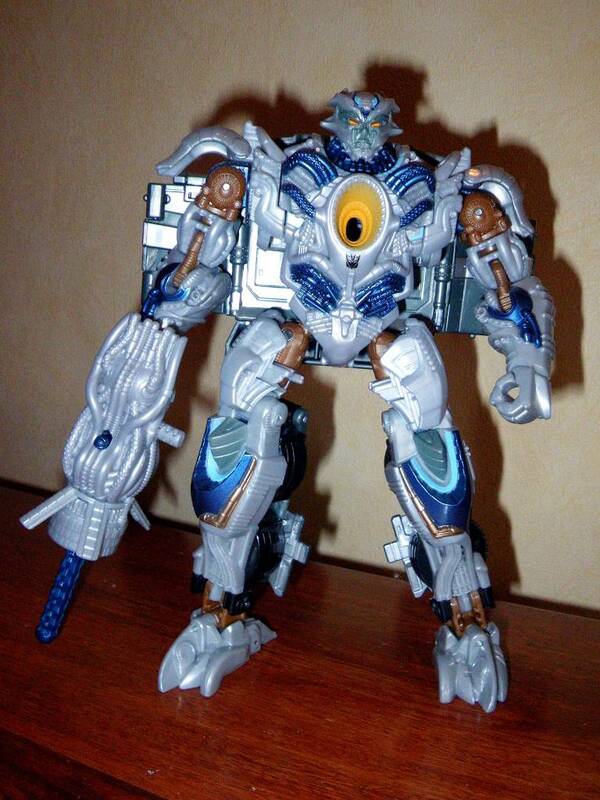 The majority of the robot mode is cast in light grey plastic, with some gold, black and metallic blue also used. Unlike the Hasbro version, Takara have applied copious paintwork, which really sets off the detailing using metallic blue, gold, grey and pale ‘AllSpark’ blue. 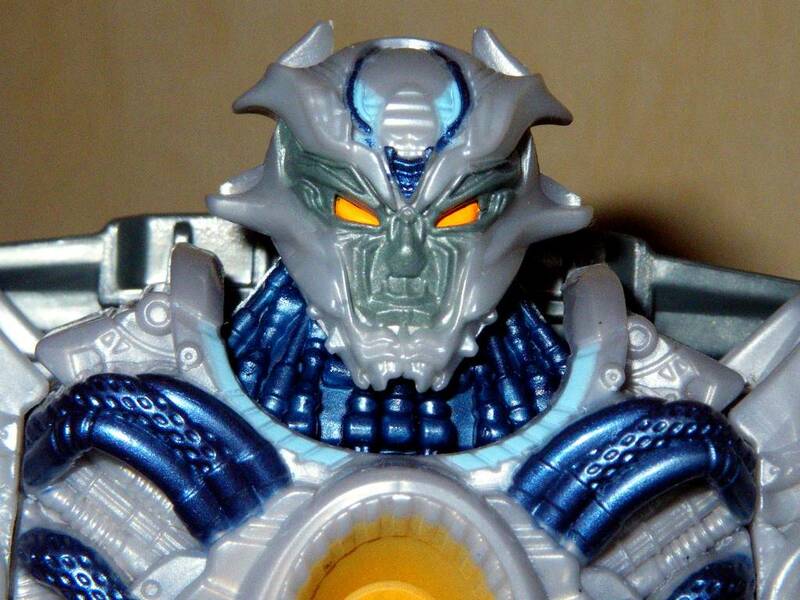 The head and face are beautifully sculpted, and picked out with dark grey paint (face), metallic blue, pale blue and black, topped off with orange eyes. The face is more human than any previous movieverse Megatron, and looks menacing rather than monstrous. The robot design also takes a lot from samurai armour. This is also the first time ‘Megatron’ has had anything resembling standard hands in the films. With 13 meaningful points of articulation, many with great range of motion, Galvatron is very poseable, and thanks to his ankles and excellent centre of gravity you can really take advantage of it. Sadly, he lacks a waist joint, and wrist articulation, both of which could have been easily included without changes to the transformation or overall design. Galvatron comes complete with missile launcher, which matches the one his arm transforms into in the film with extremely intricate moulded detailing. Sadly, it has not been designed to cover the hand, so is quite literally held as a gun. However, you can angle the arm so that it looks like it is in place of his hand. Galvatron’s robot mode is not perfect, but given the contraints the designers had to work with they have done an amazing job matching the film look in both modes. This is easily the most fun and impressive AoE figure I have found so far, and I would recommend it. Transformation Design: 9 – The transformation is simple but extremely well thought-out. It successfully takes a dark grey truck and turns it into a light grey biomechanoid robot without any truck parts on show (front on). It’s just a shame the backpack didn’t fold away a little neater, but at the end of the day Galvatron is so much fun and so cleverly designed that can almost be forgiven. Durability: 9 – Galvatron feels very solid, although the head horns can scrape a bit during transformation if you’re not careful. 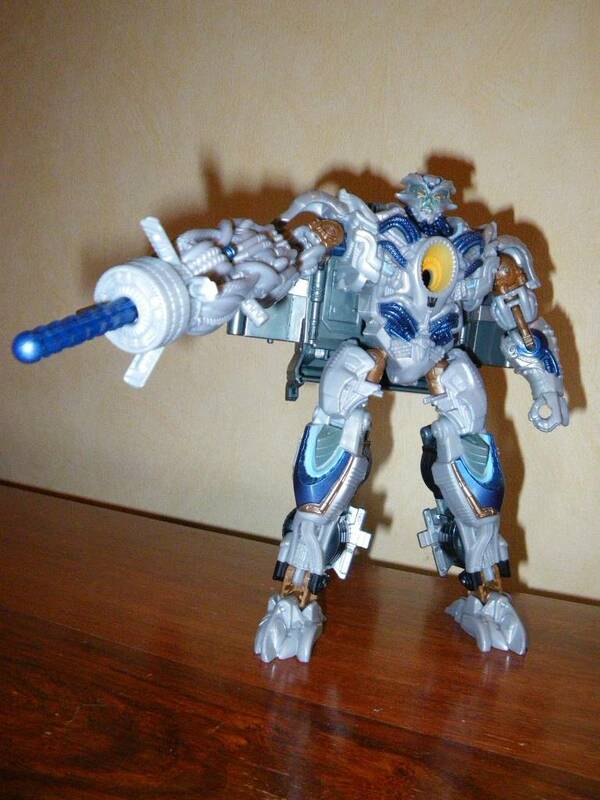 Fun: 10 – Galvatron is extremely fun to transform, and has two excellent modes. Aesthetics: 8 – Galvatron looks awesome in both modes (assuming you’ve bought the Takara version, rather than the largely unpainted Hasbro one). It’s just a shame about the slightly light paint applications on the truck mode, and the fact the backpack does not fold away as neatly as one would ideally hope. Articulation: 7 – Galvatron has decent levels of articulation, and good ankles, allowing for dynamic poses. Sadly, he could do with waist and wrist articulation which are both missing for no apparent reasons. Value/Price: 7 – The Hasbro version, priced at �25 GBP or so, looks awful, lacking much of the paint applications it really needs. It can cost a bit more to import the Takara version, although as part of a bulk order from Robotkingdom Galvatron actually cost me less than the shelfprice of his Hasbro counterpart (if he ever sees UK release). Still, I think Voyager’s are a bit overpriced. Overall: 8 – Galvatron is an excellent mould, with an extremely fun yet simple transformation. I can’t help picking him up and playing with him. Both modes are awesome, although a few minor tweaks could have made him perfect. Still, it’s an amazing figure given the film designs, and being just one of two villains with toys in the Generations line, you need him to pit against your legions of Autobots and Dinobots. Also, the other villain, Lockdown, is a terribly disappointing toy. I’d recommend Galvatron – well, the Takara version anyway.